As we highlighted last week, the Danish police announced they would be going after bicycle users this week and sure enough, they were at it. Hiding behind a tree along The Lakes, as above. This officer was largely stopping bicycle users who were scooting over the sidewalk, as illustrated below, in order to turn right while avoiding the hundred or so bicycle users waiting at the red light. Yes, hundreds of the world's best behaved cyclists waiting for red lights and once in a while a citizen on a bicycle rolls across the sidewalk (red arrows), only to be stopped by this police officer. 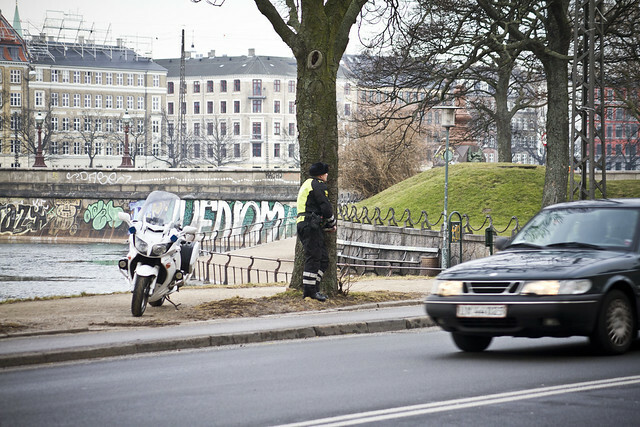 I watched for a while and the policeman spent more time leaning against a tree than writing tickets. And this was rush hour. He did get to unfreeze the ink in his pen a few times though. None of the bicycle users who cut the corner did so at any great speed and none of them bothered any pedestrians on their A to B journey. 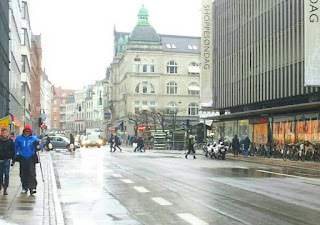 Anette Jerup Jørgensen is a researcher at Danish Cyclists Federation and she said in an article in a Danish newspaper today that, "What happens in our bicycle culture is that there is a pragmatic interpretation of the rules. People think that as long as they don't bother others, they can bend the rules here and there." "A survey has shown that 75% of respondants have turned right on a red light within the past couple of months and by far the most of them think that it was okay to do so. So there is a conventional practice of ignoring the red light and an unspoken norm that it doesn't matter, as long as you take care of pedestrians." 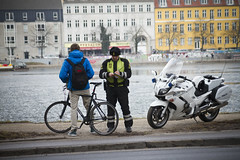 What's interesting - and under-reported - is that if you consider the enormous volume of bicycle traffic in the Copenhagen morning rush hour, there are very few fines given. A sensationalist Danish tabloid wrote today that "one officer handed out a whopping 34 tickets in the morning rush hour." You can bet that there were several thousands bicycle users rolling past the spot and that 99% of them did so as they do every day - legally. But that's not news, is it. "10,000 cyclists obeyed the traffic rules on a stretch of street in the centre of Copenhagen!" But 34 fines IS news. I blogged back in 2007 about another police raid on cyclists. They handed out 777 tickets in the course of a work week. Out of literally several hundred thousand cyclists. But hey. It gets in the news. The police are "doing their job". Blah blah blah. When I was cycling into the city this morning, it was business as usual. I watched the behaviour on the cycle tracks and there was little to report. A few right turns on red lights, etc. But nothing worth writing home about. The funny thing is that the police always stand at the same spots. 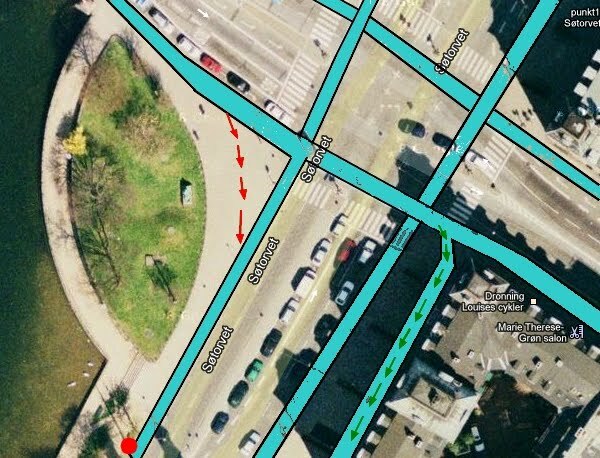 They are inadvertantly handing the City of Copenhagen's Bicycle Office a map over the Desire Lines of the bicycle users. On the badly photoshopped map up top, look at the cycle track on the right, with the green arrows. That was a stretch of sidewalk that many bicycle users used as a short cut to get to the next street over. Until the City made a temporary painted lane on the spot and later made it into a permanent cycle track. Observing and listening to the citizens' Desire Lines. The sidewalk shortcut on the map, that ended with the rather bored police officer writing a few tickets should feature a right turn cycle track that avoids the red light, like at many other intersections. Like everywhere else, when a few bicycle users bend the rules, it's because there is inadequate infrastructure for them or there is no logical reason for them to stop there. The police, like many urban planners and traffic engineers, do not think Bicycle first. If they did, things would be very different. One of our readers, Thue, sent us this photo from another regular hunting spot. Police on the right. He also reported six Known Enforcement Spots in Trapster.com for where the police hang out a couple times a year to "enforce the law". These spots are freely available to the City for planning retrofits of the intersections. There is a new Twitter account @cykelrazzia where we'll be tweeting, in Danish, the location of these bicycle traps and we'll keep using the #cykelrazzia hashtag until the week is over when the police have reached their quotas and can then go back to tackling crime.